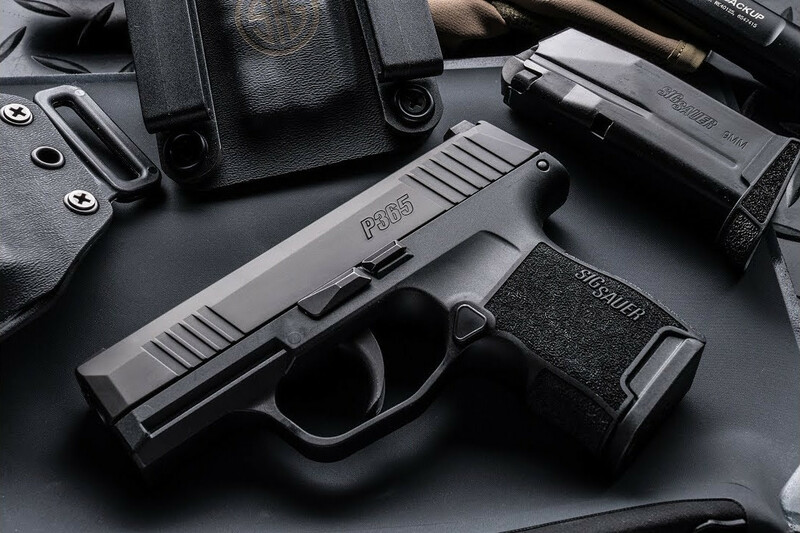 SIG Sauer is showcasing their new P365, an everyday-carry gun that does more than the competition. The P365 is a hybrid subcompact that fits inside a single-stack package while carrying an industry-leading capacity of 10+1 in 9mm Luger. The P365 is staggered-stack, polymer-framed, striker-fired pistol that draws on SIG’s enormously successful P320 concept. It pairs a railed subframe with a polymer grip assembly and a complete slide. The grips are interchangeable and even upgradable with laser sight options already in the works. 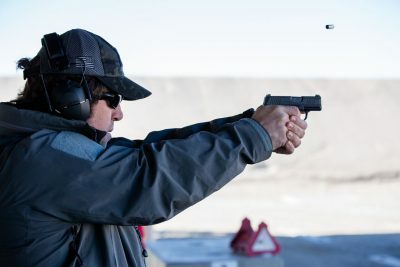 Because of its magazine design the P365 holds 10 rounds of ammunition instead of six or seven without taking up more space than similar-size single-stack pistols. SIG uses a magazine that tapers with single-stack dimensions at the top with a wider base for added capacity. 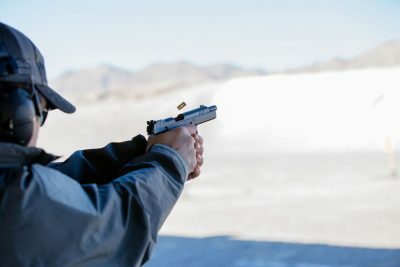 This means that SIG can slim down the frame and controls for ease of concealment while delivering the kind of capacity only grip-chopped service pistols can offer. Unlike a lot of concealed-carry pistols, P365 comes with real sights. The base model comes with very usable full-size 3-dot tritium night sights. It also has a great trigger. Flush magazines are available with flat and extended floorplates and every P365 comes with a 12-round extended magazine, too. Despite its size, the P365 is rated for overpressure +P ammunition including all SIG Elite 9mm ammo. In the hand at SHOT Show Media Day. At the range, I was amazed by how much I liked to shoot the P365. SIG could have chosen to shoehorn the P320 chassis into a smaller grip but that would have been a compromise. 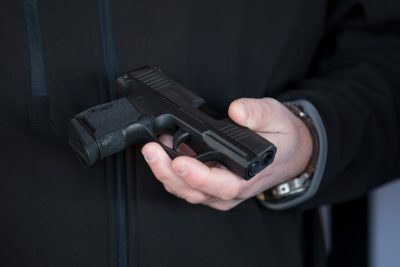 By developing a 9mm-specific fire control unit for the P365 SIG managed to shrink the pistol into a different class of handguns. I have to applaud SIG. I was amazed by how much I liked shooting the P365. With its capacity advantage, small size and good controls, it’s possible that the P365 will be the next go-to everyday carry handgun solution. I’m looking forward to testing it on the range for a more detailed review. SIG put a suggested retail price on the P365 of $599, which puts it in-line with many of their entry-level service pistols. Expect street pricing to be around $500 and even less with good deals. Looking forward to getting this one in for a full review. Laser-equipped models will follow shortly and shouldn’t cost much more. Because this is a major product launch by SIG holsters and other accessories will also be widely available. For more information about these and other SIG Sauer products visit sigsauer.com. Shot my sig 365 today, very impressed, best carry gun I’ve ever owned, and I have a lot of guns. So tried to order a 2nd gun today, everyone is sold out for 5 weeks, that say something!! I have a Glock 43, 26, and a Shield and love them all. However, this P365 is a little jewel. I have run 400 + rounds through it without a failure. This is the latest gun from Sig so I hope all the bugs have been corrected. I am a gun lover not a brand hater but this is my new carry. It is awesome. I am a retired LEO and carry or have a firearm at hand 24/7 for most of my 68 years. I probably have carried and own most small pistols and revolvers since the Colt 1903/1908 and Remington 51 and of course the most reliable revolvers. Anytime I experience a failure I quit carrying that gun. function Sig has achieved with this weapon. The trigger is amazing and after about 500 rounds of mixed ammo of different bullet types, velocity and quality proved accurate and reliable beyond my expectations. It is easy to shoot well as sights are great an feels good in my hand. I can’t say enough about how much I like P365 as it surpasses “Glock perfection”. Only time will tell if it maintains it. I visited the factory store in NH last week and got to handle the P365. Very nice package. I carry a 938 and love it. I like the P365 even better for its capacity, size and weight. I will want to shoot before I buy, but for now I think this is my next SIG. Nothing like carrying a loaded striker fired with ONE in the Chamber and NO SAFETY ! It does look like SIG has raised the bar for this type of pistol, and that’s definitely a positive for those of us who find the various options lacking in some way. Perhaps we’ll see competitors incorporating a trigger activated laser into the slide (that’s safe, accurate, and reliable), ambidextrous controls, and a USB port for charging our phones? I have the Shield, XDs, PM9, and G27, but if this pistol lives up to the hype, I may be buying one. Can’t wait to read unbiased reviews, and get a chance to handle it! One more thing the acc rail upfront looks like they were having flashbacks to the 90’s and the usp. I carry a sheild with an apex trigger and a Ruger lc 9 now. This brings back memories. Back in 03 I made a very poor hiring choice and had some issues. I need a pocket carry gun not in 380. I went to purchase a Glock but it would not fit. I ended up buying a kel-tec p 11. I actually loved the gun but it got sent to the back of the gun safe because I had to replace a number of intervals because of rust just from carrying it. Yep kel Tec. Have been eating for a gun from a less budget minded company that did the same thing. Very similar concept except striker. Replaceable grip and a frame or what ever from metal. Finally someone did it. Won’t be the last. The Taraus PT111 G2 has more features, comes with two 12 round mags and can be had on sale for about $200.00. A best buy! Crazily enough they seem to be coming out with a 12 round extended for this one. No. The PT111 G2 is bigger in every measurement and heavier than the 365. Plus it’s a Taurus so it is without a doubt a POS. If this works as well as the hype claims it will, not only would I want one, but I think a line up of these would be hot sellers. Offer one with a G19 grip and barrel length would still be an awesome carry gun. Even a full size based on this would be desirable. Plenty of people could run a slimmer gripped gun better than the “standard” size we see today. Better yet, since this is using the serialized frame insert (pretty sure I saw that in one of the articles), make it modular. WTF!?!? So the trigger is “great”, is it? You haven’t even PULLED that trigger. Have you? No. By “great”, you maybe mean the finish is real smooth? You maybe mean that it LOOKS “great”? Has ANYONE actually pulled this “ great” trigger? What KIND of action does this trigger represent? Double action? Single action? Both? DAO? Just “great”, eh? WTF is wrong with you? I have seen several articles out there from people that have shot it. Sig invited a ton of guys out to nh this winter to shoot it. I don’t know if those were pre production. You offer up what can only described as a psychopathic rant, and then wonder what is “wrong” with the author? Wow. Over-react much ? Makes me wonder how some people can make it thru any given day without being in the news – road rage incident, workplace shooting, domestic situation…..the daily possibilities are endless. 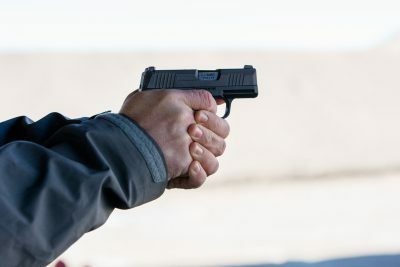 If you get that bent out of shape by reading a simple review, which is by its very nature an OPINION piecc….your (over) reaction is proof that some people really shouldn’t carry a firearm. Wow Charles, how about what’s wrong with YOU? I love my P290 and carry it every day, but if this striker fired pistol does not have a glock type trigger pull that feels like I am squeezing a wet sponge i may have to make a change. another stupid small .9mm same as they ever were – same as they ever were… YAWN …!!! Yeah… a G43/Shield size gun with %30-40 more capacity… yawn. Lol. If this gun proves reliable, I’ll be grabbing one. Seen more interest in this P365 in YouTube comments than any other firearm in previous 7 years. If comments reflect interest, this will be the top carry gun in 2018 and until any other company matches its features.Disclaimer: pure speculation based on YouTube request comments 😂😂😂. But this positive first look forecasts a winner. Until other companies match it?? SCCY 9mm is the same size & capacity as the P365 including the magazines sig “designed” or should we say copied, same size & capacity. All these people that are suppose to have shot it still can’t/won’t tell us what type of Trigger DOA/SOA/both all we know is it’s striker fired…..need to know what type of trigger, SIG’s site is useless, says standard, NO such thing.